I wnet out with my camera after a hiatus, and it was a dreadfully dull day, which was disappointing; but then coming home in the dusk quite suddenly I saw this big moon, so I thought “thank you”! Thank you, Meanderer. It was a surprising moon that just suddenly seemed to be there, and through the willow leaves it looked so big, though when I went down to the river it had shrunk to a little moon again. Thank you, John. 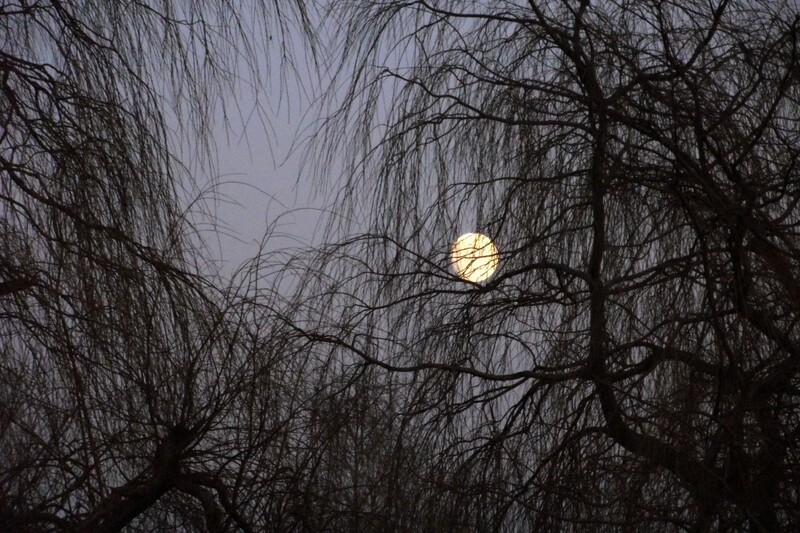 It was a vibrany moon that suddenly appeared, so I was happy to capture it posing behind the silhouetted willow leaves. Lovely: “The Moon in the Willows”.